To fully understand saltwater pool chemistry one must start by separating fact from fiction, as many misconceptions stem from a lack of knowledge. The most common misunderstanding about saltwater pools is they are fundamentally different and do not use chlorine as a sanitizer. In reality, saltwater pools use a special process to create free available chlorine (FAC), but require similar products to maintain water quality. It is true, weekly maintenance for saltwater pools does not have to be difficult and they may not require as much time to maintain as a traditional halogen (chlorine [Cl], bromine [Br]) pool, but they are not maintenance-free. In fact, one of the primary reasons the water quality is so much easier to maintain is because chlorine is consistently produced as a sanitizer. Saltwater pools experience many of the same problems that befall traditional pools, which use chlorine as the primary sanitizer, but there are fewer issues that require attention because of the unique way the sanitizer is produced. This includes balancing the pH, maintaining a chlorine residual, solving cloudy water and surface problems, battling algae, and preventing scale. Each of these potential issues can be frustrating for a pool owner, but can be prevented with proper maintenance. 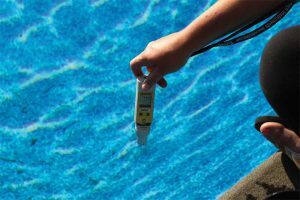 As many pool technicians know, pH is a key water balance parameter. Almost anything that comes into contact with the water has the potential to impact the pH—even the products that are routinely used to help maintain the water can influence how the pH behaves. In the process of generating chlorine in saltwater pools, the water’s pH increases over time. This is a result of the byproducts that are created when salt is turned into free available chlorine. Salt is the first thing that is needed to produce chlorine in a saltwater pool. It can be added using any number of pool salt products available. Keep in mind, some alternative sources of salt that are not made for the pool environment may contain impurities such as iron (Fe), which can eventually cause surface issues. The reaction that produces free chlorine, or hypochlorous acid (HClO), occurs within the electrolytic cell, commonly known as the chlorine generator. As chloride ions pass through the cell over the plates, chlorine gas is created through the process of electrolysis. The chlorine gas created from the electrolysis of salt reacts with the water to form hypochlorous acid. This is why saltwater pools are, in fact, chlorine pools. The active sanitizer is not any different than the end result of adding chlorinating tablets, sticks, granular chlorine, or liquid chlorine. They all form hypochlorous acid. Ultimately, saltwater chlorine generation is just another method to chlorinate a pool. Sodium hydroxide (NaOH) is also produced during this chemical reaction, which has a pH of 13.5. It is this byproduct of electrolytic chlorine generation that is responsible for the troublesome and steady increase in pH experienced in saltwater pools. Improper salt levels can cause damage to the cell, as well as inhibit the production of chlorine. As a result, saltwater pools require routine pH adjustment. A weekly application of a pH decreaser product is a necessity for pools using a chlorine generator. Without it, many problems can occur as pH continues to rise in the pool. If left unchecked, high pH can lead to multiple problems in the pool environment, including ineffective sanitizer, cloudy water, scaling, and algae. During the season, another issue saltwater pools may experience is failure to maintain a free chlorine residual. 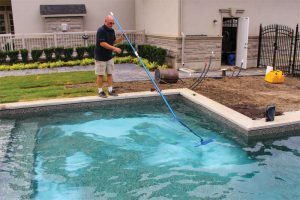 This is also a common issue in traditional halogen pools, but in saltwater pools this problem can be typically tracked down to one of two causes. First, the pool is experiencing a chlorine demand, or second, the cell is no longer capable of producing enough free chlorine. Salt is the first thing that is needed to produce chlorine in a saltwater pool. Chlorine demand is a problem that can happen to any pool using chlorine as the sanitizer of choice. A chlorine demand is present when the pool shows the consistent inability to establish a sanitizer residual. This occurs when there are too many contaminants in the water consuming the chlorine and not enough sanitizer is present to oxidize them. Further complicating this matter is pools experiencing a chlorine demand may not exhibit any other problematic signs; however, in most cases, the presence of a chlorine demand situation quickly leads to other water quality issues such as cloudiness and algae. Pools experiencing this problem do not contain enough sanitizer for bather protection, which is the most important job chlorine serves in the pool. The severity of the demand often varies on what is causing it to happen and the ability to resolve the problem may be impacted as well. A pool’s chlorine demand can originate from inorganic and organic materials. Demands caused by organic material are typically much harder to solve than those caused by inorganic material and, as a result, may take much more chlorine. Often, with chlorine generation, the cell cannot produce chlorine quickly enough to provide the necessary amount required to break a demand. If the demand is too large, an additional source of chlorine is needed to re-establish the chlorine level. 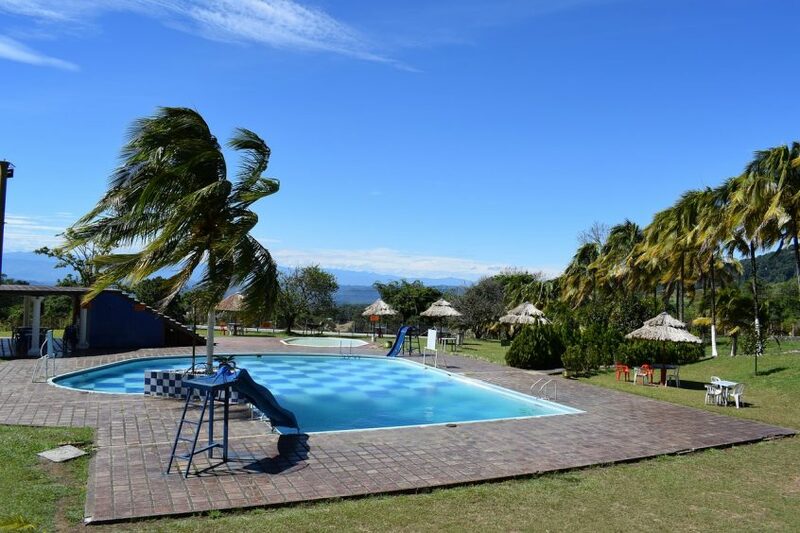 There can also be times when the pool is not experiencing a chlorine demand, but still may not be able to maintain a free chlorine residual. In most cases, taking an investigative approach to the problem can determine the root cause. Often, the cell simply is not producing enough chlorine to maintain a one to four parts per million (ppm) residual. Common issues that can lead to this occurrence are not running the chlorine generator long enough, having an undersized cell, scale buildup on the cell plates, problems with water balance, or the physical condition of the cell. Since the electrolytic cell only generates chlorine when the pump is running, it is critical to ensure the system operates a sufficient amount of hours per day. Simple enough, but the cell only generates during the ‘on’ part of its cycle. Although the time cycle varies by manufacturer, the concept is the same. The output setting is a percentage of the ‘on’ cycle. For example, if a cell has a cycle of 100 minutes and is set for 20 percent, the cell will run for the first 20 minutes of each 100-minute cycle. Therefore, if the pump runs for 10 hours a day, a unit set at 20 percent will only generate chlorine for a total of two hours out of the 10 the pump is running (and only two hours in a 24-hour period). Adjusting the output setting and the pool pump runtime are often necessary to ensure enough chlorine is being generated. Another issue that can lead to low-chlorine residual is the use of a cell that is too small for the pool. Some manufacturers offer different types of electrolytic cells. If a cell is undersized, it may not be able to produce enough chlorine to maintain a residual of one to four ppm—even with ample pump runtime and setting the cell for maximum output. Running a cell at maximum output will also dramatically shorten its life and, as a result, replacement costs will be incurred much more quickly than if the cell was adequately sized. The electrolytic cell does have a finite life; the more it has to produce chlorine, the shorter its lifespan. Scale deposits can also impact how well an electrolytic cell produces chlorine. As the pH of a saltwater pool increases (due to the production of sodium hydroxide), scale occurs as carbonate ions collide with hydroxide ions near the electrolytic cell plates. As the pH increases, more hydroxides are available for this collision, resulting in the accumulation of scale on the plates. Most cells, as part of their routine run cycle, use reverse polarity in an attempt to rid scale from the plate surface. Once accumulation is substantial, however, this method of cleaning is no longer effective and a cell cleaner should be used. Scale buildup will reduce the ability of the cell plates to pass electricity through them as part of the electrolysis process, which is integral to chlorine production. The more scale that builds up on a cell, the less chlorine is produced. There are two types of calcium scale that commonly form on electrolytic cell plates: calcium carbonate (CaCO) scale and calcium phosphate (Ca2+) scale. The formation of each type is influenced by different factors. Calcium carbonate scale is the most common, as it is formed within any pool environment and makes up the majority of scale that is found on chlorine generator cell plates. Calcium carbonate scale is influenced by three main factors: increases in water temperature, pH, and calcium or carbonate ion concentration. Elevated water temperature causes an increase in molecular motion and, as the calcium and carbonate move around much faster, they are more likely to bump into each other causing them to form a bond. The increase in pH causes bicarbonate ions, which are more prevalent at higher pH levels, to dissociate and release carbonate ions into the water. The higher availability of the carbonate ion makes scale more likely to form. The high pH environment found with a chlorine generator cell, as discussed previously, make it an ideal place for calcium carbonate scale to form and adhere. Finally, the more calcium and carbonate that is available in the water, the more likely they are to come into contact with each other and form scale. Different water balance parameters lead to the formation of calcium phosphate. This particular type of scale is not driven by a high pH, so the impact of rising pH inside the cell does not influence this scale formation. Calcium phosphate is not very soluble in water and a precipitate can form quickly. However, just because scale precipitates, or falls out of solution, it does not mean it will adhere to a surface. There is a lot of turbulence within a chlorine generator cell, making it less likely for any calcium phosphate scale that is formed to stick and cause a problem. Calcium carbonate scale is much more of a concern than calcium phosphate scale with respect to chlorine generator cells. In addition to the previous parameters that limit the amount of calcium phosphate scale found in chlorine generator cells, there is a much higher level of carbonate in pool water than there is phosphate. Even in what would be considered a high phosphate pool (1000 to 2000 parts per billion [ppb]), it is still a low level compared to carbonate (e.g. 2000 ppb is two ppm). There is typically well over 100 ppm of carbonate in the water. Reactions are often ‘competitions’ between two species, the one with the higher concentration tends to react faster and be more prevalent, making calcium carbonate scale the most likely to form based on concentration. Therefore, it is imperative to use a scale inhibitor to help prevent this type of buildup in pools using chlorine generators. Some manufacturers also warn against high phosphate levels to prevent the small amount of calcium phosphate scale that may form in the chlorine generator. Therefore, including a phosphate remover as part of routine maintenance will help reduce phosphate levels and add another level of protection against phosphate-based scale. In addition to cell runtime, size, and scaling, there are other parameters that can affect the production of chlorine in a saltwater pool. One of the first things to look at is the salt level. Improper salt levels can cause damage to the cell, as well as inhibit the production of chlorine. When chlorine levels are low, many make the mistake of thinking the problem can be resolved by adding more salt. This is not the way to respond, however. Most manufacturers recommend a range of 2600 to 4000 ppm of salt. Many pools with the correct salt level have low-chlorine residuals because of one or more of the previously discussed issues. Low-water temperature will also affect the cell and inhibit chlorine production. Most chlorine generator cells will shut down when the water temperature falls below 15.5 C (60 F). This level varies by manufacturer, but in early spring and late fall, cells are often not functioning due to water temperature, leading to an absence of chlorine production. Generating chlorine in these conditions can damage the cell and its components. Finally, the age of the cell will also impact chlorine residuals. The plates, where electrolysis occurs in the cell, are coated with a metal called ruthenium (Ru). This metal is necessary for electrolysis, and subsequently necessary for generating chlorine. As the coating wears away with age, the ability of a cell to generate chlorine decreases. Often, a lack of chlorine is due to an aged cell that needs to be replaced. One of the most common issues in saltwater pools is algae. These pools are susceptible to algae just like a traditional chlorine pool. Maintaining a proper free chlorine residual and pH balance is important because many saltwater pool owners choose not to add a preventative algaecide as part of their routine maintenance. High pH reduces the effectiveness of the chlorine that is generated and provides a carbon dioxide-rich environment that can lead to the increased probability of algae growth. Most algaecides are suitable for use with saltwater pools and are a great product to add to any maintenance routine or when troubleshooting algae problems. Should algae bloom in a saltwater pool, it can be treated just as it would be in a traditional chlorine pool. If the water is swampy green, a floc product can speed up the clearing process. As with any algae treatment, shocking the pool to rapidly increase the chlorine residual is a vital component to successful treatment. In a saltwater pool, the boost button is not effective in this situation since the chlorine is slowly delivered over time. A chlorine shock product should be used as part of the algae treatment, as indicated by the label directions on most algaecides. Once the algae problem has been treated, chemically cleaning the filter will keep additional problems from occurring in the pool. Finally, after the algae treatment is complete, a maintenance algaecide can be introduced to the maintenance plan to prevent future outbreaks. Saltwater pools provide a premium experience to pool owners; however, some maintenance must occur to prevent problems from happening. These problems are the same issues that are often found in traditional chlorine pools and are resolved by similar activities. There are some issues that are specific to saltwater pools and require specific products or actions to resolve them. Ultimately, clean, clear water is the goal for any pool owner, whether using traditional chlorine or a saltwater system. This article was written by Alicia Stephens and originally appeared on Pool & Spa Marketing [link].